Check out all the new features here! MONTAGE OS v2.5 adds new sound, control and workflow enhancements to MONTAGE. Check out all the new features and download information! MONTAGE OS v2.0 added the ability to load MOTIF XF, XS and MOXF Performances into User memory. OS v2.5 includes ALL the original MOTIF XF Performances as Presets. Further, the MOTIF XF Performances have been “MONTAGified” with Super Knob assignments and Audition demos. Mix your DAW tracks using the MONTAGE faders and knobs. Select, arm, mute and solo DAW tracks with the MONTAGE right-hand buttons. Combined with powerful USB Multichannel Audio/MIDI connectivity and the MONTAGE Connect VST/AU, DAW Remote makes MONTAGE a totally integrated music production system. This is great if you want to capture the actual notes generated by the Arpeggiator as opposed to just the chords played. This lets you easily use MONTAGE Arpeggiator content with other hardware, software or virtual instruments for further production. When inspiration strikes, start recording with the MONTAGE Song Recorder, capture the Arpeggiator data and continue developing your idea inside your DAW of choice. MONTAGE OS v2.5 features a useful shortcut for mapping the Assignable Knobs. When editing an individual Part, you can now assign a parameter to a destination at the Part or the COMMON level. This is done by pressing and holding the Part [COMMON] button and moving an Assignable Knob. This is a subtle but usable shortcut when assigning MONTAGE parameters. • Waveform Keyboard Select: Allows you to load an audio file directly to a key. A “Keyboard Select” box now appears when loading in an external audio file. • Waveform Center Note: Designate a “Center Note” matching the keyboard note to the original waveform pitch. This is useful when a pitched waveform is in a certain key and you’d like to place that waveform on the respective keyboard note. Very useful when assembling key maps for samples. Unlike other synthesizers, MONTAGE is platform-focused and constantly evolves with OS updates. 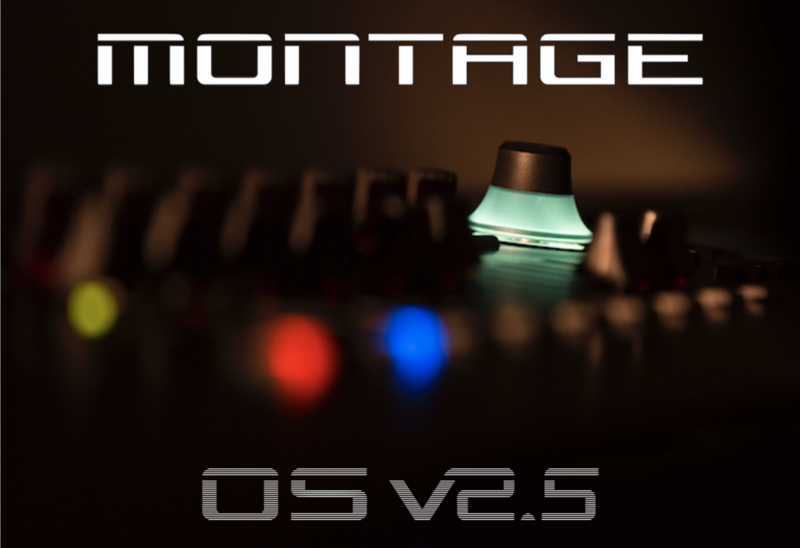 MONTAGE OS v2.5 is yet another step forward for our flagship Music Synthesizer. IMPORTANT NOTE: BACKUP and SAVE YOUR DATA before updating!